How to define the Colombian salsa? This is in Cali, good dancers motivated House of machines, tireless and lively salsa Cali born. A mixture of Pachanga, Boogaloo, Mambo, Cumbia, currulao, and in some cases, is not found, belonging to another Colombian folklore dances as Mapalé and joropo, salsa Cali “Cali dance”. Today, salsa schools grow and multiply in Cali. 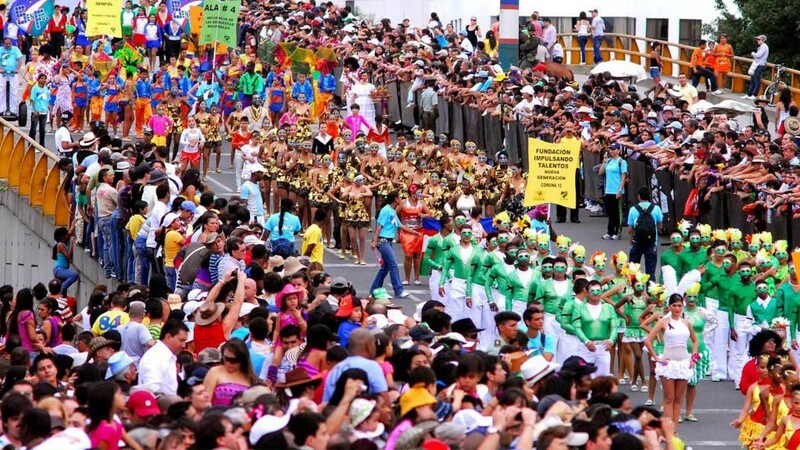 The Salsodromo, the equivalent of the Samba of Rio de Janeiro, is seen through each year the best schools of salsa in Cali. Colombian salsa is growing throughout the world and rewarded each year. Features: Salsa “Cali” is tonic. Deepens the movement of the legs, especially the knees down, and lace. There is a subtle movement of the hips, torso, and shoulders. Sometimes they are small jumps, small series of steps, fell, vibrations, swinging and circular movements. It also includes figures or fastest laps with arms. Running simultaneously the movements of the foot, usually a surprising vivacity! Salsa Cali (the Cali) introduce rhythm syncopated body movement, and that they recreate the rhythmic pulse and emphasize the “cuts” (rupture) of the music: is central to Cali to practice listening to music so that the body absorbs the rhythm and the melody of some instruments. Whenever is corresponds steps music, turns, dives (tips of the feet and them heels that mark the time in the soil), as well as “dumps” (creating moments in the time). While this is set, the style is open caleño: its ability to integrate other styles that enrich and transform everything giving it its own identity: Salsa Cali has no limits dance to the rhythm of heart and especially through improvisation. Colombia salsa is dynamism, technique, speed, improvisation and above all passion. You should be dancing with the heart and let the rhythm move freely through our veins!